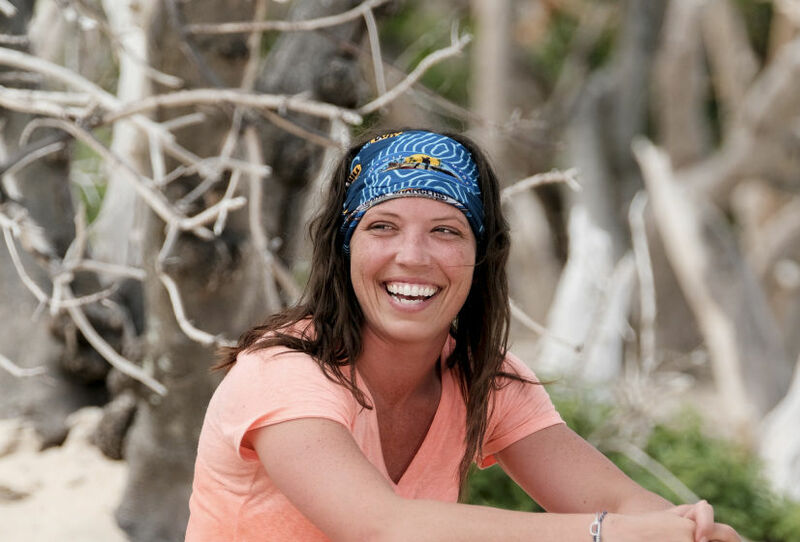 After a hard-fought season with so many ups and downs, twists and turns and far too many advantages too count, Sarah Lacina rose above the rest to be crowned the winner of Survivor‘s 34th installment, Game Changers. The police officer is said by some of her cast-mates to have played a flawless game and after making it to the end with Brad Culpepper and Troyzan Robertson, ended up sweeping the majority of the jury votes and winning by a vote of 7-3-0. Sarah was absolutely stellar this season. The way she maneuvered through the game, swinging back and forth yet still maintaining positive relationships with everyone in the game was incredible to watch. Sarah by no means played a flawless game as stated by Michaela Bradshaw, one of the seven to vote for her in the end, but she did play excellently well and somehow she was able to be a driving force behind practically every single vote without ever making herself into the next big target, something very few others have been able to do in this game. By constantly playing the middle, she was rarely actually the one in control of where the vote was headed, yet she always positioned herself in a way where she was a) able to vote for the person that went home and b) stay in good faith with every single person in the game regardless of where her vote actually went. Don’t get me wrong, there were times that she directed where the vote was going, most notably in the eliminations of Sierra and Ozzy; but more often she was just one of many votes going towards the person that ended up being eliminated. This is still impressive and shows how in-tune she was with what was going on at all times in the game but I wanted to make that distinction so as to avoid saying “she was driving the votes this season”, as by in large she piled on more often than she drove. Nonetheless, her play was absolutely amazing to watch and obviously the big question going into night was: did she do enough damage control with the jury? In other words were they going to feel betrayed by her actions in blindsiding and voting out some of her strongest allies or were they going to respect that she played the best game and give her the money? In the end, the jury made the right decision, especially after Brad made one of the most boneheaded moves in Survivor history. Sorry Brad, The Mastermind loves you, but you could have won the game here had you not underestimated Sarah’s role in this season and taken her to the end. So with that, it is now time to take a look at some of the keys to Sarah’s success on Survivor this season. What I’ve been impressed with most of all this season is how amazing Sarah was at building these great social relationships, then voting people out and then still being able to maintain those positive relationships with them even though she just sent them to the jury. One of my favourite moves of this season was when Sarah voted Sierra out in order to claim the legacy advantage as her own. The Worlds Apart contestant said to Sarah “If I get voted out I can will you my legacy advantage” so Sarah made plans to vote her out by ensuring she had the two in the middle of Tai and Michaela on board. Sierra could have easily felt betrayed by Sarah in this instance, but the relationship that they had built was so strong that she didn’t even consider that the Cagayan contestant was actually the architect of her demise. From that moment on, she had the legacy advantage in her back pocket and it actually ended up saving her that night that she had to use it. That positive relationship that she had built with Sierra and somehow maintained despite voting a different way than her on a couple of different votes and then on top of that voting her out of the game, was what kept her on that island for the long haul. You could see this from Sarah right from the start of the game. She wanted to play like a criminal and she absolutely did to a certain extent, but she probably also played like the friendliest criminal you’d ever see. She was genuine with her social relationships and was easily able to separate game relationships from real relationships outside of the game; something that just seems so hard for so many other players to achieve. Going back to even early on in the season, the positive relationships that Sarah had with everyone is there for all to see. When everyone was treating Troyzan like trash over at Tavua, Sarah was the only one actually willing to pull him in and try and use him to make something happen. This ended up working out in her favour as the two of them had a working relationship for the rest of the game. Going even further the same thing can be seen in Varner’s elimination. Jeff was grasping at straws for anything to keep him afloat as we all know, but Sarah was offering him that option of taking out Ozzy, humouring him maybe, but at least keeping her options open to all kinds of possibilities and willing to listen to his point of view. More crucially, while Brad talked down to Tai like what he wanted in the game didn’t matter, Sarah always made Tai feel safe and secure. She always asked the Californian what his perspective was before telling him her own and she was always willing to do what he wanted to do even if she was actually lying through the skin of her teeth! Perhaps most importantly of all was her relationship with Zeke, who was her main advocate in that jury. By the way, the way they changed the jury to an open discussion was amazing to see and truly did allow for members of the jury to actually change their mind about who they were voting for unlike any season ever before. As a result this was by far the best final tribal council ever as a result. But back to Zeke, Sarah had such a strong advocate for her in that jury because of that amazing relationship she built with him. Sarah is very smart. She recognized early on that Zeke was going to be a massive target after that Varner incident. You could almost tell that she knew she was going to have to vote Zeke out at some point but she still made sure to always make him feel safe and comfortable in his relationship with her, something no one else in that group really did after it was revealed that the Millennials vs. Gen X star wanted Andrea gone. Unintentionally or intentionally, she was almost playing for his jury vote. She knew he wasn’t going to win and was going to get taken out at some point, but she still had to have the best possible relationship that she could with him in order to secure that jury vote. Overall, Sarah’s social play this season was incredible and was one of the keys to her success. She put people on the jury in a pretty ruthless way and then still claimed all of their votes in the end. That takes some doing and is highly commendable. It’s even a bit Tony Vlachos-esque shall we say. But although her social play was amazing, perhaps even more impressive was her ability to always be in the know and in tune with what was going on. By swinging back and forth constantly from side to side and retaining great personal bonds with everyone on that island, Sarah was always in the know with what was happening and as a result was always able to keep herself safe. At the final tribal council, one of the things that Sarah credited for her success was in always being aware of her surroundings. I honestly do believe that this really was one of the keys to her game and it just shows again how self-aware she truly is. Obviously we can go back to the moment where she found that vote steal advantage right at Michaela’s feet when no one else managed to notice it, but there are plenty more examples to this as well. As previously mentioned, she played to the people on the bottom. She played to Troyzan when he didn’t have a single friend out there, she entertained the idea of taking out Ozzy when Jeff Varner was destined to go, she made it seem like she was still best buds with Sierra even though she was about to vote her out and she stayed by Zeke’s side even when she knew he was going to have to be the target. This is a perfect example of how in-tune she was with everything that was going on. She always knew who was going home or likely to go home next, so she catered her game to that person and made sure to try and entertain the idea of roping them in. Sarah recognized that if she could make these bonds and not alienate the people on the bottom that something good could come out of it. In the end something good came out of it nearly every single time. Sierra gave her the legacy advantage, Troyzan trusted her for the remainder of the game, Zeke gave her his jury vote and Michaela felt as though she was “badass” for voting her out with the exact advantage that she herself could have claimed. Moreover, she never let any kind of distraction get to her out there and stayed focused on the task at hand at all times. The Iowan native didn’t let the hunger or the sleep deprivation or the craziness and pressure of the game get the best of her, she just kept on swinging for the fences, day after day. Yet again, she never found herself in danger despite constantly switching sides and changing loyalties. She truly was loyal in the end to every single person on that island, and after voting them out, still managed to make them have positive feelings toward her. Well done Sarah Lacina on an amazing win! Sarah Lacina is a very good winner of this game. I am absolutely ecstatic for her that she won and so pleased that this season has ended with such an impressive and worthy winner. For me this bumps the season up slightly to where I have it currently in my Survivor Season Rankings, so be sure to check back soon to see where it lands next. Congratulations Sarah on a hard-fought and really impressive victory in one of the toughest games that can be played on this planet. It was much deserved and establishes you as possibly one of the very best to play Survivor.